The Sherdukpen's oral history says that "they originated from the marriage of a Tibetan prince with a princess of Assam, possibly of Kachari origin." 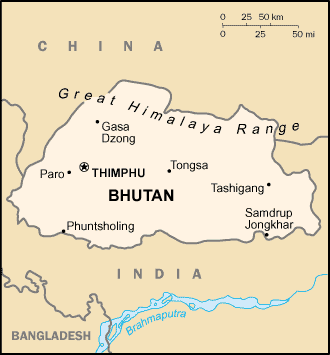 Some scholars have thought that the Sherdukpen and some of the Monpa living in the Kameng District originated in eastern Bhutan because of the many cultural similarities that these groups share. Buddhism first came to the Sherdukpen in the mid-1700s, and they have remained loyal to this religion ever since. 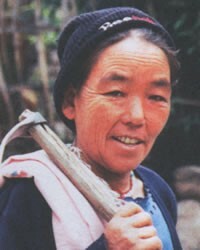 Most of the Sherdukpen people live either in India's northeastern state of Arunachal Pradesh or in Bhutan. Most of the Sherdukpen people are farmers who supplement their diet through hunting and fishing. Some have livestock. They use simple tools for their work. Visitors to their communities can easily identify the Sherdukpen because their dress is totally different from that of other peoples. The men's dress consists of a shawl, waist belt, jacket and a cap made of yak's hair. The Sherdukpen women wear a white cotton or silk gown called a sinka. Before a wedding can take place, a suitable bride price must be negotiated between the families of the bride and groom. The groom's family must come up with an acceptable form of payment to compensate the bride's family for all the years of expense and effort they spent in raising the girl. Traditionally, the bride price is two sheep, two yaks and a piece of endi cloth [a shawl]. The most common form of marriage is a negotiated arranged one. The parents of both the boy and the girl arrange the marriage. The girl is ritually eloped by the boy's parents and their relatives. These days love marriages are increasing in number. After the bride price has been settled, a Buddhist lama is called in to consult the horoscopes to determine the best time and day for the wedding to take place. Buddhist lamas, known as chize, double as shaman priests among the Sherdukpen people. These priests act as mediators between the people and the spirit world. Though they are Tibetan Buddhists, the Sherdukpen closely adhere to shamanistic and animistic practices. For countless centuries the Sherdukpen people, few in number yet unique, lived and died without any knowledge of the gospel. The 1991 census returned just 13 Sherdukpen people who declared themselves as Christians. The Sherdukpen people need a spiritual hunger that will not let them rest until they find and embrace Jesus Christ. * Pray that the eyes of the Sherdukpen people will be opened so they can see Jesus as He is. * Pray for believers to come to them with the gospel. * Pray that soon they will be discipled in the ways of Jesus, resulting in transformed communities. View Sherdukpen in all countries.